So, like with Robin, there are a few stories I should write down before we forget them. 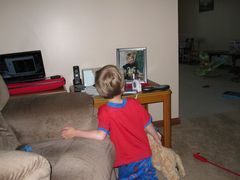 Robin likes watching and listening to the baby monitor, every time Jonathan hiccups, he stops and waits for more noise. So, Jonathan had an elevated bilirubin level while he was still in the hospital, so we had our first doctor visit the day after discharge. His level was still high, so we got another visit for the next day. At that second visit, his bilirubin was even higher, so he was admitted to Pediatrics for a 12 hour stay under a Bili light. He had dropped to 7 lbs even before being admitted, but is up to 7 lbs 1 oz by discharge. He’s home now and seems to be feeling, eating and pooing much better. Jonathan Allen Betka says Hello! He weighed 7 lbs 3 oz and was 19.5″ long. 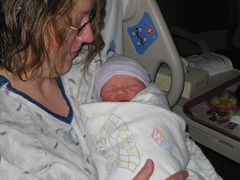 Mom and baby are doing fine, we came home from the hospital on Monday evening. More pictures.